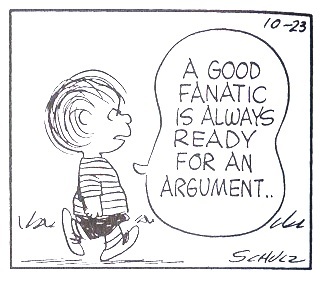 The latest What's New Online from the BMJ editor draws attention to the poll on bmj.com, which asks "Is fanaticism a form of madness?" This is linked to two published articles that debate whether Anders Breivik is sane . The argument in the Breivik trial is about whether he is psychotic (see previous post in which I suggest there is little doubt that he is not psychotic). That is not to say that he is not psychopathic (mentioned in neither of the BMJ articles). Psychopathy is distinguished from psychosis, although it was originally named "moral insanity". Psychopathic people are not deluded. And being deluded is not just about whether fanatical ideas are shared by others, which is the argument used by Taylor in his BMJ article for regarding Breivik as insane. What matters is whether the thinking process that led to the ideas is abnormal - in Karl Jaspers words whether the ideas are "of morbid origin". Jaspers regarded delusional ideas as "ununderstandable", because even putting oneself in the deluded person's position and seeing the world from their point of view, one is still unable to understand how they could hold such a belief with delusional intensity. Obviously there may be a metaphorical sense in which one could understand the thoughts but delusional ideas are believed literally. Interestingly, the Mental Health Act in England and Wales was amended in 2008 to abolish the distinction between mental illness and psychopathy in terms of the way in which the conditions are regarded under the Act. Because of Breivik's determination not to go to a psychiatric hospital, it could be argued that he is not detainable in psychiatric hospital because he is not treatable (under the old Act) or because there is no appropriate medical treatment available to him (under the amended Act). Aubrey Lewis (who I've mentioned in another previous post) wrote a Lancet editorial in 1940 on the mind of Hitler. Hitler wasn't deluded. Lewis quoting Oswald Bumke points to the extent to which cold, unfeeling, ruthless, apparently conscienceless, violent, cruel people attain their ends and "how great a role fanatics and other psychopaths play in history and especially the history of revolution". Martyrdom, eg. 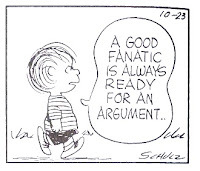 suicide bombing, may be one outcome of fanaticism. But others, such as Breivik develop the "unshakeable conviction that they are in the right" and end up in a law court. Others play their part on a larger stage, such as Hitler or more modern tyrants. The real problem with Breivik and Hitler is their personality not mental illness as such. They represent the uglier side of human nature. It is important to recognise this rather than trying to distance ourselves from them by labelling them as insane. I'm not an anti-psychiatrist, or am I? It irks me sometimes when I'm seen as an anti-psychiatrist, rather than a critical psychiatrist. After all, I make my living from being a psychiatrist. My critique of practice is merely intended to make it better. I'm not against psychiatry as such, just how it's put into effect sometimes. I've been thinking why I'm viewed in this way. The critical psychiatry website that I set up years ago (before the Critical Psychiatry Network was formed) was originally called the anti-psychiatry website, but I changed the name because of the confusion it caused (see THES article). But I suppose there is a sense in which I am against what is happening in modern psychiatry. It's difficult to get the right balance about how oppositional to be. And I've always encouraged critical psychiatry to be seen as a broad church ( eg. see previous post). There are people in the critical psychiatry movement who want to abolish psychiatry and think we do not need a Mental Health Act. But I'm not one of them. 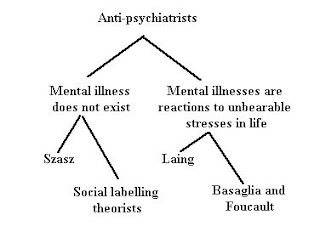 The problem is the degree to which modern psychiatry is a faith believing that mental illness is a brain disease (see eg. previous post). If I'm not a believer then I guess there's a tendency to see me as an anti-psychiatrist. What needs to happen is for this situation to be made more transparent. Psychiatric practice should not be dependent on taking a step of faith. By the way, a chapter of my edited book, Critical psychiatry, was on the history of anti-psychiatry. It is important to understand this context, but it's about time we moved on. Witness, on BBC World Service, last month broadcast about the Rosenhan experiment (listen to podcast). Rosenhan died earlier this year (see Stanford Law School news). There's also an earlier, longer radio programme by Claudia Hammond in the Mind Changers series. 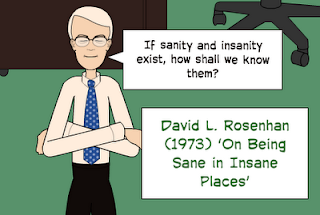 I do think Rosenhan's 1973 paper in Science, On being sane in insane places, is still relevant. It very much contributed to the crisis in psychiatric diagnosis that led to DSM-III trying to tighten up the definition of the different syndromes by operationalising them. We're still struggling trying to revise DSM on this basis (see previous blog entry). We need a different reaction to Rosenhan. Psychiatry need not have been so defensive about his experiment. Of course psychiatric diagnosis is arbitrary to some extent. Trying to put a patient's psychiatric presentation into a single word isn't going to be sufficient, nor is it always going to be very helpful. I'm not against trying to classify psychiatric disorders, but the limitations need to be recognised. They're idealised descriptions which do not describe entities as such. The extent to which psychiatric diagnosis is subjective is not a sign of scientific deficiency but of its meaningful nature. Suprana Choudhury & Jan Slaby have published an edited collection entitled Critical neuroscience (see website). This is a response by a group, which began meeting in Berlin, to what they call the “neuromania in the natural and human sciences”. They describe the “shared sense of irritation about the hubris of neuroscience and the reverberations of ‘brain overclaim’ in areas of everyday life far beyond the lab”. Such ‘brain overclaim’ is apparent in an editorial by Mary Phillips from the latest edition of the British Journal of Psychiatry. Although she acknowledges that there are limitations to neuroimaging studies in psychiatry, she holds out the hope that they will differentiate individuals with unipolar v. bipolar depression; identify those at future risk of developing psychiatric illness; and find those who are most likely to respond to a specific drug. She even suggests neuroimaging might be more accurate than clinical assessment. At least Phillips has committed herself to outcomes that we can look back on and see that she has not achieved. But I doubt this will curb her wish-fullfilling phantasies. And why does the British Journal of Psychiatry publish such speculation, implying it could be fact? We need to admit, like Choudhury & Slaby, that neuroscience is misguided inasmuch as it seems that its aim is to solve the mind-body problem, which it won't do.